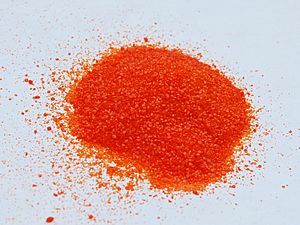 Ammonium dichromate is a chemical compound. It is composed of ammonium and dichromate ions. Its chemical formula is NH4Cr2O7. It is a reddish crystalline solid. It is a weak acid. It is a strong oxidizing agent and can explode when heated in a closed container. This is because ammonium is a weak reducing agent, making a redox reaction. It is used in volcano demonstrations. It is poisonous because it contains dichromate, which is similar to chromate. It is a carcinogen. It is used in oxidation reactions. It is made by reacting chromic acid and ammonium hydroxide. Ammonium dichromate Facts for Kids. Kiddle Encyclopedia.